Shenandoah Noah doesn’t like farming, like the rest of his kinfolk in the valley. Because farming means driving a plow in the hot sun behind a mule. “[A]nd work is something that Shenandoah Noah doesn’t care for.” He just wants to sit in the shade with his hounds up in the mountains. The illustrations are cute, and they work nicely with the story. Soon Shenandoah Noah has chopped a large pile of firewood logs – and Noah’s axe is poised over head, like he’s splitting one more. Then he’s hauling buckets of water to a pot on his fire – and the illustration shows spikey flames and long twirling swirls of smoke. Standing behind the pot, Noah dunks all his clothes with a stick. He’s wearing nothing but a scowl – and it does look like a lot of work. The next page finally shows his long flannel underwear dripping on a tree. 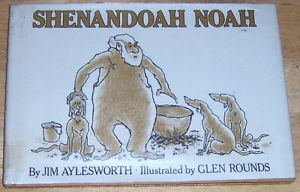 The character of Noah comes to life, both because of the text about his dislike of work – and the sketches which actually show it. Soon this man who hates work is doing work – and even his kinfolk in the valley can see the smoke from his fire. This seems suspicious, since chopping firewood is work, and “[E]verybody knew that work is something Noah doesn’t care for.” So Noah’s nephew heads up to investigate – with a shotgun. And unfortunately, chilly Noah is warming himself under a bearskin rug. And he’s too embarrassed to let his kinfolk see him without any clothes on. The startled nephew mistakes the rug for a real bear, and Noah shouts out “Don’t shoot! It’s me!” But the frightened nephew runs away, and tells everyone in the valley that Noah has turned into a talking bear. Which is fine with Noah – since he likes being left alone. Under his tree, the overworked mountain man draws a conclusion from all of this trouble.